The global economy has been hit strongly by the financial crisis and the fundamentals of many countries have changed dramatically. Hence, the scope for sustainable growth seems of increased interest. 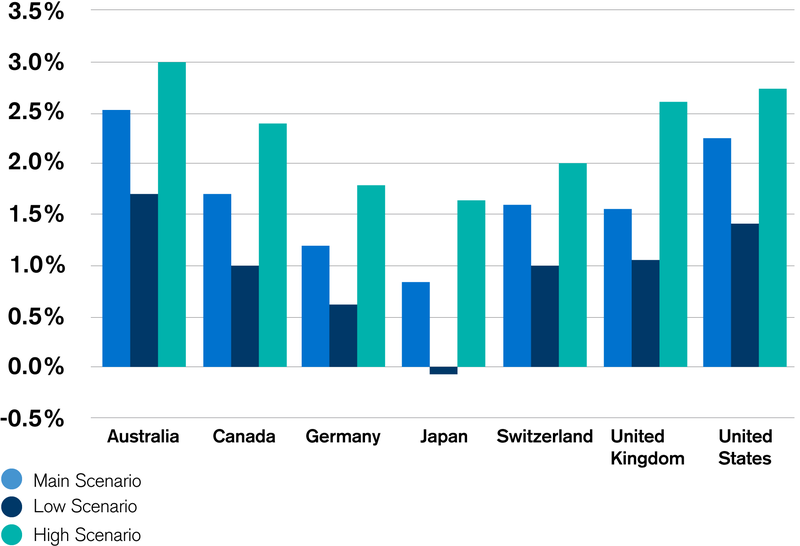 According to varying assumptions on the growth determinants we have developed estimations of potential output for seven industrialized countries until 2030. The potential output is an appropriate concept to address this issue, since it describes long-term GDP growth with full utilization of the production factors, that is the labor force, capital equipment and infrastructure as well as productivity, which is determined by technological progress. In our main scenario, we assume the decline in the growth rate of productive capital in the aftermath of the financial crisis to be cyclical rather than structural. Hence, due to the overall recovery of the world economy and the likely increase in investment given stronger demand, we expect a rise in productive capital growth above post-crisis rates. At the same time, expectations concerning productivity development are rather cautious due to the still ongoing slow adoption and speed of diffusion of existing and new technologies. Productivity largely depends on the extent to which firms operate in an institutional, regulatory and legal environment that fosters competition, avoids unnecessary administrative burdens and provides modern infrastructure and access to capital. Conditioned by the financial crisis, market dynamism and access to capital have weakened considerably and the rate of new enterprise creation is still subdued. Therefore, we expect a continuation of the observed productivity growth. Finally, the expansion of the labor force is limited by population aging, though with significant differences across countries. In the main scenario, we assume an improved integration of the working-age population into the labor market and consequently slightly higher labor force participation rates as implied by the current declining trend. In our main scenario, Australia and the United States exhibit the highest growth rates of potential output in 2030 with 2.5 percent and 2.3 percent, respectively. This is essentially due to their comparatively favorable demographics, which support the labor force. Canada may achieve a potential growth of 1.7 percent in 2030, similar to the evolution of Switzerland and the United Kingdom. The projections for Germany and Japan are considerably lower. Whereas potential growth in Germany is expected to reach 1.2 percent until 2030, the outlook for Japan is even worse with 0.9 percent. Both countries are exposed to weakening demographic effects. Demographics will likely play a central role for the further economic development for all countries. On the one hand, there will be a direct effect on economic growth through diminished supply of labor. On the other hand, demographic and employment trends determine consumption and savings behavior of the population and can ultimately also affect investment. In the more pessimistic low scenario we assume that growth in productive capital will not recover to pre-crisis levels and that the participation rate will fail to improve, since neither older generations nor women will successfully be better integrated into the labor market. This means that the effects of demographic aging on the labor force will be felt more strongly. Productivity growth rates will not recover either to pre-crisis growth rates. This weak performance of productive factors implies lower potential growth rates for all countries. Due to the considerable decrease in the labor force, the growth rate of potential output will even turn negative for Japan. Conversely, the high scenario assumes not only an increased growth in productive capital approaching pre-crisis levels, but also a higher participation rate due to a stronger integration of older cohorts and women into the labor market. To achieve this higher rate, a continuation of the reform process in the pension system seems to be inevitable for most countries. As a third assumption in this scenario, we expect a higher productivity growth compared to historical growth rates, fueled by technological advances. In this scenario, all countries achieve potential growth rates above 1 percent until 2030. The countries with the strongest potential growth outlook are again Australia and the United States with a rate of 3.0 percent and 2.8 percent, respectively. Germany and Japan are able to achieve a potential growth rate of 1.8 percent and 1.2 percent, respectively, with the stronger productivity contribution partially offsetting the demographic effect. To sum up, all of the above scenarios show an outstanding performance of Australia and the United States. In our main scenario, these countries will be able to maintain their current levels of potential growth. Canada, Switzerland and the United Kingdom will lie only slightly below. These countries can record relatively high growth rates of productive capital and a higher participation rate. For Germany and Japan demographics will be of major concern. Unless they will not be able to challenge these developments, their growth in potential output is expected to be relatively weak in the years to come.